IA brings you exclusive coverage from the Queensland Magistrate's Court, where Senator Fraser Anning is defending a lawsuit filed by Senator Pauline Hanson alleging a breach of copyright. BARRISTER: How did you come to notice Fraser Anning’s book? HANSON: I received it as a gift from Senator Anning — as a Christmas gift, last December. BARRISTER: And what caused your alarm bells to ring? 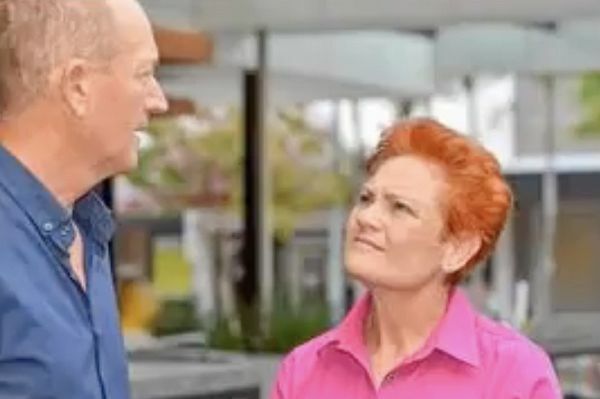 HANSON: The title, Wise Words of Wisdom, by Fraser Anning. Very similar to my own, Wise Words: The Wisdom of Pauline Hanson. BARRISTER: Yes, yes, I see. And did anything else cause you concern? HANSON: Yes. Several points. It was printed by the same printing company. James Ashby Printers. The biography notes were very similar, highlighting his connection to One Nation, his high profile in right-wing, anti-immigration, pro-white circles and his Queensland roots. Same as my own. BARRISTER: And what was that? Any key phrases in particular? HANSON: Its complete text — page for page, same as mine. BARRISTER: That’s astounding. Please explain. HANSON: Flick through my book, Wise Words: The Wisdom of Pauline Hanson. You notice every page is blank. See? Hanson flicks through her book. HANSON: Blank. Blank. Blank. Nothing. Not one word. BARRISTER: And Fraser Anning’s book? Wise Words of Wisdom? HANSON: I have a copy here — have a look. Hanson flicks through Anning's book. HANSON: Blank. Blank. Blank. Not a word! You know it's good satire when you don't know whether to laugh or cry. BARRISTER: Yes, I see. Thank you. That will be all. Senator Fraser Anning is called to the stand for cross-examination by Hanson's lawyer. BARRISTER: Can you see the similarities? BARRISTER: Okay. Your title, Wise Words of Wisdom? ANNING: It’s my right to title my book with any words I choose. BARRISTER: Despite its similarity to Pauline Hanson’s book? ANNING: Haven’t you heard of the concept of "freedom of speech"? Well, I can tell you, it stretches to book titles too. It is my right and I will defend my right. BARRISTER: That’s well and good, but how can you explain a text that matches Hanson’s page for page? ANNING: Coincidence. Nothing more. Hanson’s book is all about herself. Mine is not even about me. In fact, it has nothing to do with me. BARRISTER: Really? You’re kidding, aren’t you? ANNING: No, I’m not. I love comedy. I have a passion for comedy and I am quite a student of comedy. Especially the earlier British comedians. Tony Hancock. Eric Sykes. Peter Sellers. Spike Milligan. Tommy Cooper. And my favourite of all, Norman Wisdom. ANNING: I am even seriously contemplating a career in comedy if things don’t pan out well for me at the next election. I read up on all things Norman Wisdom. His career, his quotes, films and so on, and voila, I decided to pen a book exclusively using what I regarded were the wise words of Norman Wisdom. The result is there for you to see. BARRISTER: Do you seriously expect us to believe that load of rubbish? ANNING: It is not my fault Norman Wisdom did not say anything particularly wise. Funny, yes. Wise, no. Hence the blank pages. BARRISTER: How do you explain it has exactly the same number of pages as Pauline Hanson’s book? BARRISTER: That’s it? Is there any more? ANNING: Yes. I’m thinking of putting out a cookbook. I’ve heard they sell well in Australia. That should help to show I have ideas of my own and have no need to intrude on Pauline’s intellectual property. BARRISTER: Yes. And what will this one be called? ANNING: You Have to Break an Egg to Do Something Useful with it.